The Oregon Cultural Heritage Commission recieved an NPS grant of $92,386 in 2013 to document Oregon and Idaho labor camps. It was just a coincidence when about six years ago, Janet Koda, 61, saw a black-and-white photo of her family pictured at a World War II farm labor camp. Koda’s sister found the photo in a Japanese American book, and then her niece would once again find the National Archives photo online. 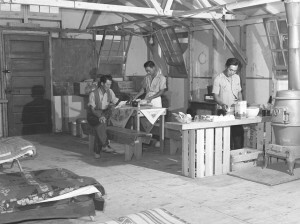 The image shows Koda’s family in 1942 gathered around a picnic table in a tent at Garrison’s Corner camp near Nyssa, Ore. The Japanese Americans are staring patiently at the man behind the camera, photographer Russell Lee. Lee served as a photographer for the Farm Security Administration from 1935-73. 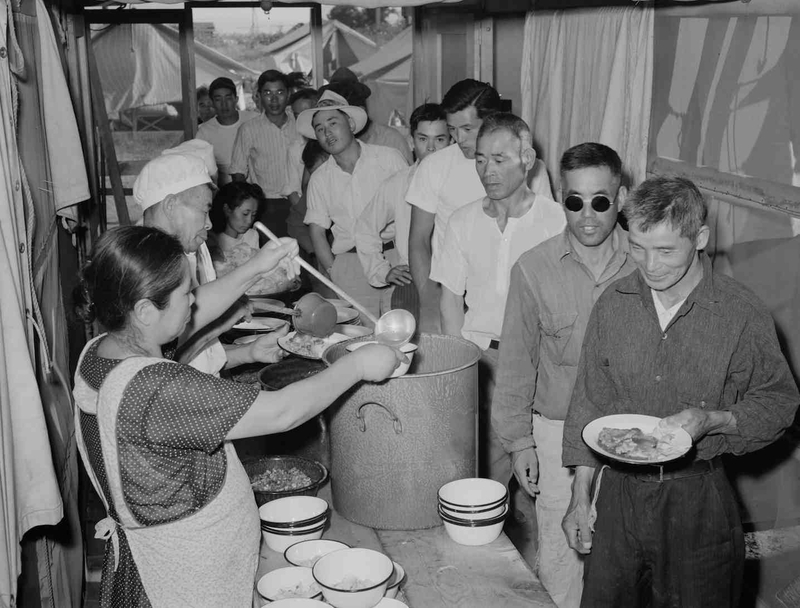 From the spring to the summer of 1942, Lee captured the unjust removal and subsequent incarceration of Japanese Americans in the United States. He traveled during July and August to labor camps in Idaho and Oregon, where he snapped images of families like Koda’s. 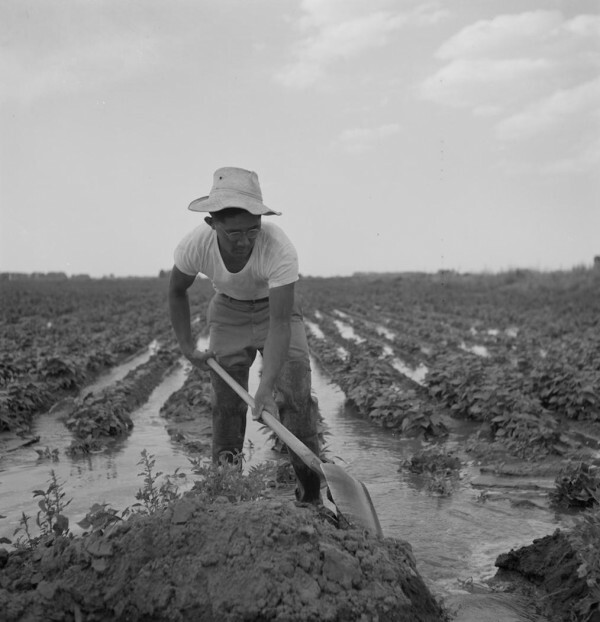 During WWII, the Farm Security Administration and the War Relocation Authority operated the farm labor camps that employed Japanese American laborers to harvest crops like sugar beets, which were used to make sugar, rubber, ethanol and ammunition. Laborers were recruited first from temporary assembly centers in Portland, Ore.; Puyallup, Wash.; Sacramento, Calif.; and Stockton, Calif. Japanese American laborers later came from behind the barbwire fences of Heart Mountain, Manzanar, Minidoka, Topaz and Tule Lake. The exhibit — which includes 45 photos and an oral histories component — will open onSept. 12 at the Four Rivers Cultural Center in Oregon. From there the exhibit will travel to the Pacific Northwest region. “I’ve been working on this project for a little more than two years. It really started revving up about a year ago because someone said, ‘Hey, that’s my father and my mother,” said Morgen Young, a JACL Snake River chapter member who is also the project director and historian. Young contacted the Pacific Citizen last year to ask readers to help identify unnamed people pictured in the photos. She also needed firsthand accounts for the exhibit’s oral history section. That article caught the attention of 79-year-old James K. Tanaka of Monterey Park, Calif.
Tanaka was not able to identify family members in any of the photos, but he participated in the exhibit’s oral history project. He shared his experiences as an 8-year-old boy living with his father and mother at Minidoka and later the Twin Falls labor camp in Idaho. The traveling exhibit documents some 33,000 Japanese Americans like Tanaka, who left WWII incarceration camps from 1942-44 to work as seasonal laborers. The Oregon Cultural Heritage Commission received a National Parks Service grant of $92,386 last year to document agricultural labor camps in the Pacific Northwest. Financial support for the project also came from the Idaho Humanities Council and the Malheur County Cultural Trust. Young, who is leading the exhibit project, says she was able to identify many people in the black-and-white photos with the help of the Japanese American community in Eastern Oregon. However, she still needs help identifying people in photos now uploaded to the photo-sharing site Flickr. Photos included in the exhibit will have captions with the names of all who have been identified. Koda was in the fifth grade when her family left the labor camp in 1964. It was before the Beatles arrived in the U.S., she recalls. Thanks to the “Uprooted: Japanese American Farm Labor Camps During World War II” exhibit, Koda now has a piece of family history she never had before. For more information about the project, visit the Flickr page at www.flickr.com/photos/119596064@N05/sets/, email uprooted@gmail.com or call (503) 333-4914.